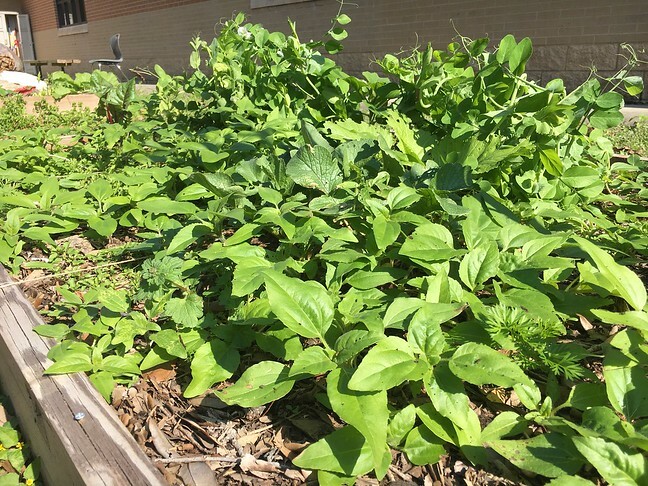 The consequences for missing any of these mulching steps is big: weeds. That weeding chore can be made even worse if the soil surface disturbed more than it needed to be when readying soil for seed planting. It was clear that a few of the garden classes may have omitted the first or second (maybe both?) layers of leaf mulch. Since soil remained exposed for weeks over the long winter break, Nature seeds — aka weeds — were left to grow unchecked. So next time, students, be sure to mulch. And try not to disturb the soil. Thankfully, it was a pretty day and I had nothing else pressing on my calendar. Let the weeding chore begin. Eek! There’s sunflowers in them thar hills. Before weeding a garden, it’s important to know what’s already been sown: planned versus unplanned plants. Planned plants are typically domestics, that is, seeds we got at the store or by collecting from the previous year’s harvest. Nature’s plants are just that — seeds dropped by Nature. Square foot plots allow for quick visual recognition of domestics right where you sit, both by their foliage and by how-many-per-square were planted. For instance, carrots and radish are planted 16 seeds per square (4 rows x 4 columns = 16 plants), so it’s easy to spot the densely populated squares and anything within them that doesn’t belong. ‘Weed’ is a subjective term; if it’s not wanted, it’s probably a weed. 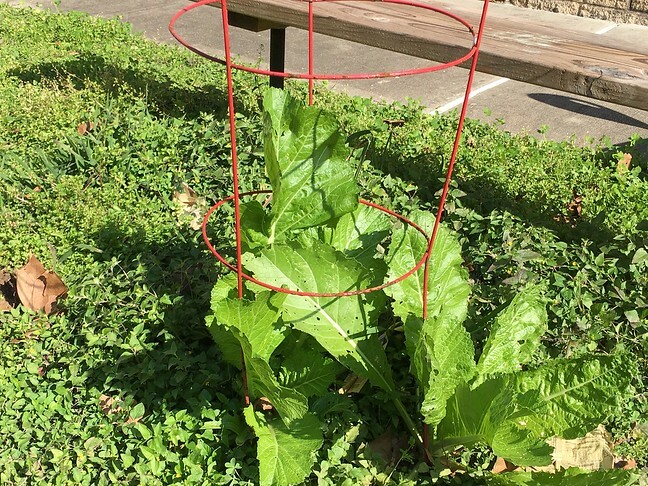 A non-carrot, non-edible — a classic weed. Pinch it at the base. Toss it aside for rot. 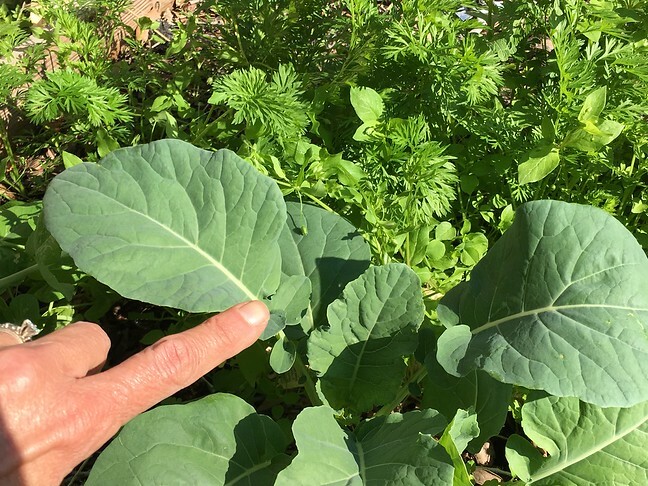 Either broccoli or cauliflower in a carrot plot. Sometimes, nature provides edibles for you, without any work or forethought on your part. Sometimes, those edibles are also domestics! Either way, they are all called volunteers. The nice thing about volunteers is that they tend to come up right where the nutrients are the best. It’s like the seeds seem to know something about the health of the soil where they sprout. It’s zero garden work for all parties involved, just leave them alone, get out of their way, maybe nibble a few within the day. 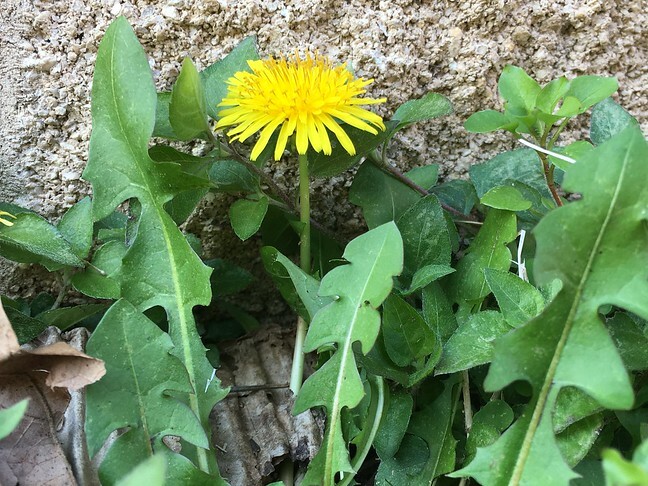 ‘Leaf me be,’ says the Dandelion. ‘Lettuce live!’ Mustard chimes in. We’re all volunteers here, when the day is sunny, and some of us are slightly punny. get mowed down by accident). After a bit of pulling, pinching, and tossing, the garden bed is looking much more organized, even intentional. And, finally a good firm spray (blast?) with water to lock the whole mess all into place. 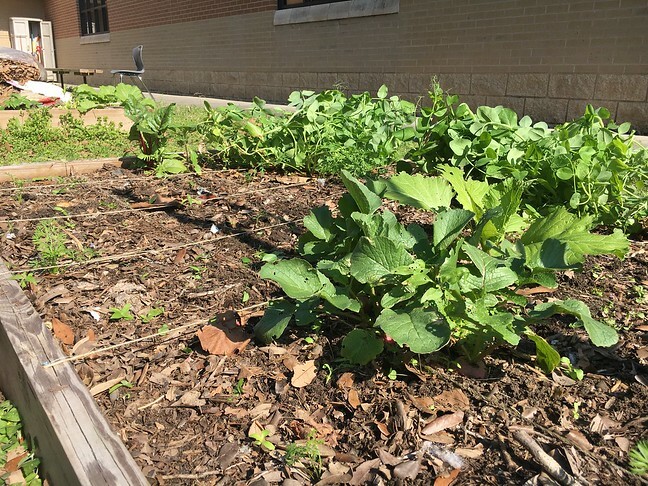 This north-south facing school garden space can become a wind tunnel on blustery days. We want all those leaves to stay in place when the March winds come. What’s your favorite way to beat the weeds? I find my leaf mulch grows more rolly pollies than my plants can handle. We get plenty of rollie pollies too — an important member of the Soil Food Web. Did you know they’re not insects but crustaceans? I did! There’s a sea creature whose name I forget that looks similar. That’s when I learned. They eat my plants though… I know everything says they don’t, but they chew around the stems in rings. I can’t seem to keep a healthy population. It always over grows on me. The non-carrot, non-edible appears to be henbit, Lamium amplexicaule. To your non-s you can add non-native, given that this species invaded from Eurasia. 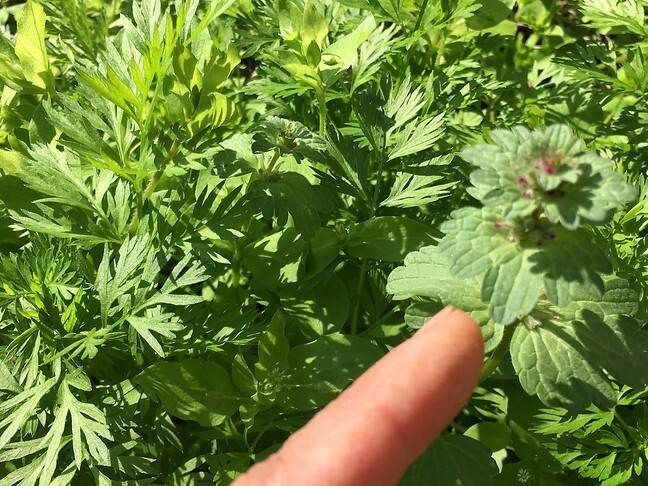 Henbit is one of the first plants to bloom each year. Henbit. Yes, thank you for that! We have lots of henbit and the summer sunflowers are popping up all around too. Don’t know what variety those are either. I’d guess some cultivar. Last weekend I was surprised to see a common sunflower (Helianthus annuus) flowering along the MoPac expressway. I’ve noticed at least half a dozen native species already blooming. These are definitely ‘common’ in that they grow in fields everywhere down here. The before-after pictures show how quickly and prolifically they sprout! 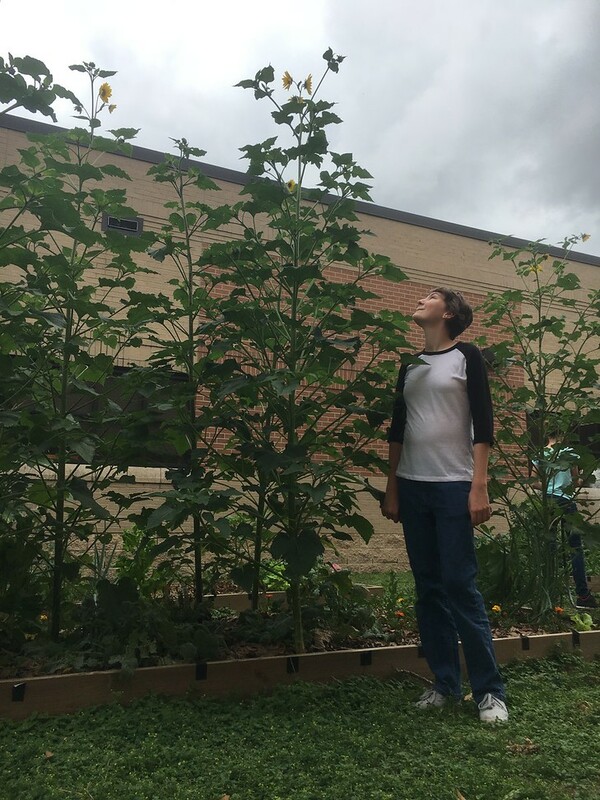 Sunflowers are left in place — planted around — as their roots till the soil, their dried stalks provide winter habitat for native bees, and the dried seed heads provide food for birds. What’s left of them is used in compost. Closed loop gardening! We’re a fan of henbit in the lawn here. My daughter picked a bunch for a bowl of water vase for the bathroom counter. I don’t let her see the henbit massacre in the veggie beds. To our defense, the henbit outside the beds — of which there is many — grows and blooms fabulously! Unfortunately, though, the district staff sees weeds as needing to be mowed. It’s sure that massacre day is coming ..